Angela Howdehell works for the Kansas Council for Economic Education and is based at Wichita State University. She is today’s guest author. Two minutes later, I’ll be speaking with a teacher instructing the same class at a different school and I hear something like “I love teaching economics in my world history class” or “I love bringing economics in my business class.” The longer I work with the Kansas Council for Economic Education, the more I understand why the idea of teaching economics might be confusing to some. Economics is everywhere, so it can and should be easily integrated into almost any K-12 subject. It is very practical and relates directly to the real world. Students get that! It’s a great thing that economic skills are also found in many of different content standards. While sifting through old resources early on in my career, I found a reference page that would soon become one of my favorite documents. 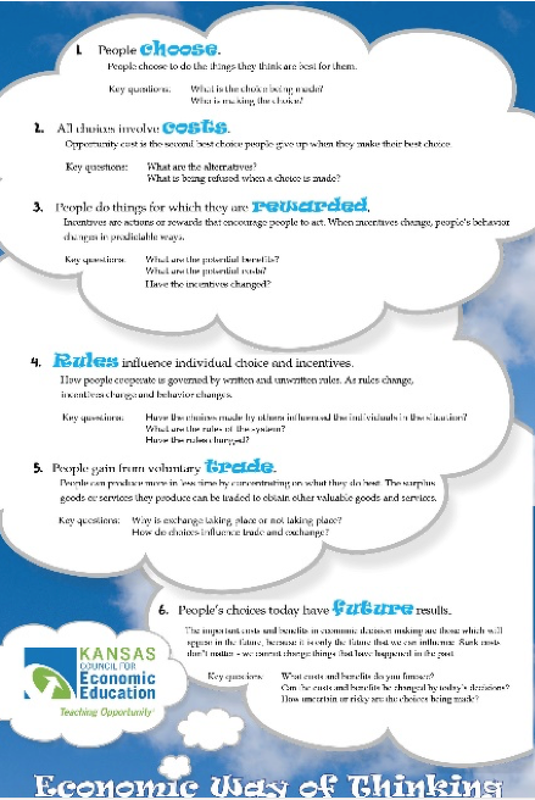 Our network refers to it as The Six Principles of Economic Thinking also know as The Handy Dandy Guide. This guide can be found in many of the resources provided through our national network of councils and centers for economic education. For example, the Understanding Economics in U.S. History curriculum guide uses the six principles to help students gain a better understanding of events throughout history. Teachers can also find the guide referenced in the first lesson in our Financial Fitness for Life curriculum series. Most situations involve making choices. People evaluate the costs and benefits of different alternatives and choose the alternative that seems best to them. Costs do not necessarily involve money. The most important type of cost is opportunity cost: the next best alternative that people give up when they make a choice. People respond to incentives in predictable ways. Incentives are actions or rewards that encourage people to act in a certain way. Incentives can be either positive or negative. When incentives change, people’s behavior changes in predictable ways. 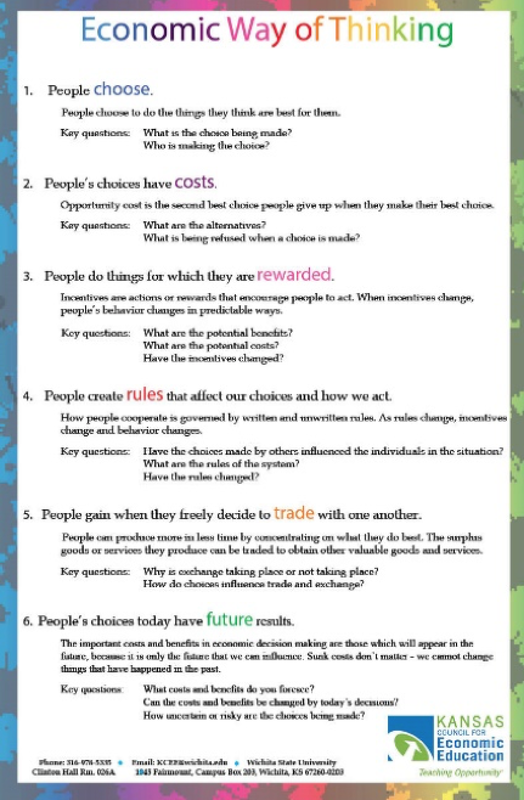 People create economic systems that influence individual choices and incentives. People gain when they trade voluntarily. People can produce goods and services at lower opportunity costs when they specialize in what they do best. Then they can trade what they produce for goods or services that would be more costly for them to produce. In this way, both sides gain. People’s choices have consequences that lie in the future. The important costs and benefits in economic decision making are those that will appear in the future. The study of economics stresses the importance of making decisions about the future because we can only influence the future; we cannot influence things that happened in the past. 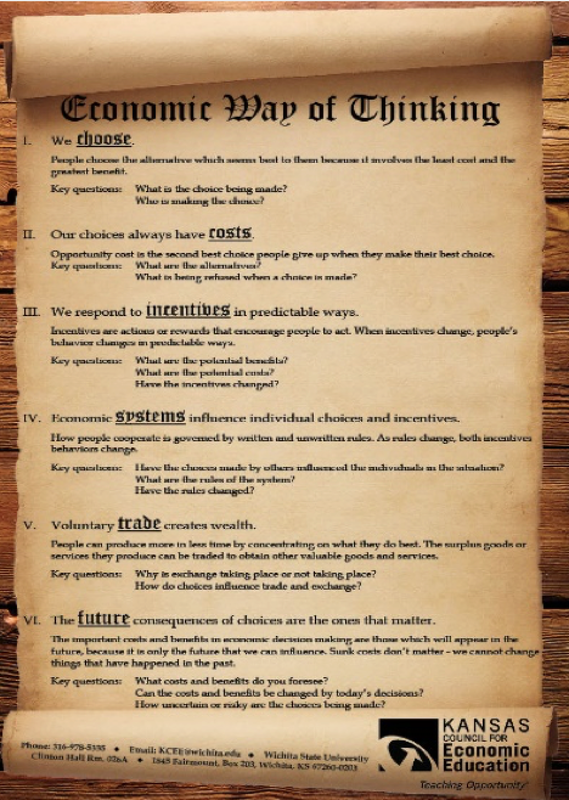 I hope you will find the above guide beneficial to incorporating economic principles in your classroom. If you are looking to expand economics in your classes, watch our calendar of events for Summer and Fall workshops and find even more resources on our site to help. We will also be hosting the 2017 Kansas Social Studies Conference on November 5-6 in Wichita. So be sure to save the date!